Last August, people at Asherons Call celebrated its ground breaking 100th content update of the game. Players got to experience new features in the game such as the PvP land control and the secret societies that enriched the whole AC experience for new and old players alike. 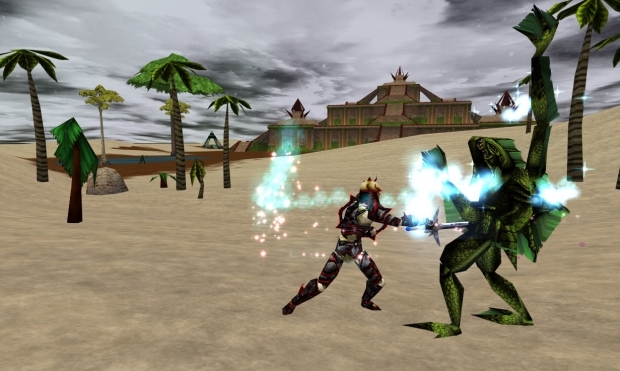 We at Onrpg had the chance to talk to Asherons Call and got the lowdown on whats happening with the game 3 months after its 100th content update. Onrpg: It has been three months since you released your milestone 100th content update, Ancient Powers. How do you feel about reaching this, and how are you dealing with the changes the update caused? Javier: We felt a great deal of satisfaction at having completed such an ambitious project. We put together the features and content for the 100th Update without expanding the size of our team and while maintaining the monthly content updates that our community expects. Wed been designing and developing all that content for a year beforehand, so it felt like the culmination of a long and often difficult process. At the same time, we knew that the massive changes we implemented, especially adding an extra level to our highly complex loot system and adding the next tier of magic spells, would be hard to balance even in the most optimal conditions. We expected that some things wouldnt work quite as expected when its out of testing and it gets into the hands of our players, so we knew that there would be a few months of tweaking and balancing to follow. The important thing, we felt, was to show a commitment to incorporating player feedback to make sure that the wide system changes end up where they should be. Onrpg: What were the things you considered when you thought of the game play changes that were included in Ancient Powers? Javier: One thing we wanted to do was to do something fun and interesting for the players who have been loyally and passionately supporting this game for eight or nine years. A lot of these players had maxed out in level and were looking for something new to do. We wanted to implement the land control system that wed been forced to cut from the Throne of Destiny expansion pack in 2005, and we also wanted to expand upon that idea to make sure there was something there for all players, not just players interested in fighting over land. The secret societies and their rank advancement system, along with the treasure and magic upgrades, were part of a comprehensive effort to have something for all play styles. Onrpg: What was the overall impact to the players after the alterations the 100th content update did to Dereth? Javier: Players now have a lot of options on how to spend their time in Dereth. The 100th Update changes gave them meaningful hunting options: seeking keys and shards to get access to our new high-level chests, questing to advance in rank within their societies, hunting and trading for the supplies to craft the new tier of spell scrolls, or fighting each other for control of the black markets. Onrpg: What are your plans for the Black Market in the succeeding updates? Will you include more unique items to be sold? Javier: The Black Markets are part of a larger effort weve been making to add alternate currency mechanics to the game. A year before the 100th Update, we experimented by adding a new mechanic to our very popular Colosseum dungeon (where player groups can take on successively stronger waves of creatures to see how long they can hold out) by rewarding players with coins, spendable for special Colosseum-only prizes. We added a similar token trade-in mechanic to our high-level hunting ground in the Empyrean Graveyard, which has also been very popular with our players, and to the Olthoi-overrun hunting area in the northwest of Dereth. The Black Markets dont quite function the same way with an alternate currency, but the concept of exclusive rewards is similar. Were committed, long-term, to continuing to develop more unique items for the Black Markets and all the alternate currency vendors in Asherons Call. Onrpg: Will the actions taken by societies be important in the story arc in the succeeding updates of Asherons Call? Javier: While server divergence (maintaining different content across our nine server worlds) limits the ways in which societies can affect our ongoing storyline, we do have very meaningful plans for our secret societies. The Societies will prominently feature in our plotlines and fiction as motivating factors, and we plan to give players ways to publicly earn glory for their society in-game. After several storylines that hinged on conflicts between the kingdoms of humans on Dereth, we expect the secret societies to be the prime political factors in the Asherons Call storyline for a while. Onrpg: With content updates reaching the hundreds, is it possible that new players would find it hard to take part in the whole Asherons Call experience, and what steps has Turbine taken in taking new players into account? Javier: Its true that the vast amount of content that weve added over the last nine years of content development can be a bit daunting to a first-time player. To a certain extent, we rely on one of our most enduring and beloved features, our allegiance system, to serve as a resource for new players. No other game in the MMO genre has such a robust system connecting chains of patrons to vassals, and our older players are incentivized to take new players under their wing and show them around the world. That being said, we recognize that we as developers should do our own part to help new players navigate the rich and intricate content available to them in Asherons Call, so we have a set of features planned for the upcoming year to address this concern. Unfortunately that is as specific as we can get at this point. Onrpg: Whats your response to some players who say that Ancient Powers lacked any new materials for characters who are level 180 and below, that the new content update only caters to those who are long time players and that it could serve as a problem for newbies? Javier: The easy response is that we have over nine years of content in the game already for new players and players below level 180. We recognized with the 100th Update that our highest-level players needed some new and interesting things to do, because a lot of them have been around for six or seven years or more, so it made a certain amount of thematic sense to target the 100th Update at people whove been there and steadily advancing their characters through the previous 99 updates. But even though the 100th Update was focused on high-level players, we never forgot newer and lower-level players. Over the last few years, we have made a regular policy of revisiting older and lower-level dungeons and quests to make them more interesting and more rewarding to the players they were intended for. Theres a certain amount of loot inflation that is inevitable with almost any MMO, and some of the dungeons and quests that were developed for retail or during the first few years of content development had fallen behind in terms of loot, challenge, and compelling experience. So weve been steadily upgrading those for the benefit of new and low-level players. Onrpg: Whats in store for Asherons Call in the future? Javier: Somewhat related to the previous question, we recognize that the 100th Update was primarily of interest to high-level players. While we felt that that was the smartest thing to do with our resources for that year, we realize that it cant all be about the high-level players, and you can expect the next year to bring updates and features that players of all levels will benefit from and enjoy. While we must again avoid commentary on specific features, you can expect the Asherons Call team in 2009 to address the needs and interests of low-level and new players. And, of course, well continue with our regular updates and the episodic content that continues to set the industry standard for storytelling and rich world-building.